On carnival day I was very excited. In the morning I went to have my hair styled by Barber Ann. When I put on my special dress and shoes my Mum said I looked lovely. At Carrog Station there was a carriage with four horses waiting for me and my attendants. We all climbed in and I was feeling nervous about the speech I had to make. I enjoyed the ride through the village to my school, waving to everyone as we passed by. I was both nervous and excited as I walked down the hail and onto the stage. Valerie from Plouyé put the crown on my head and then I felt like Queen Chloe!! 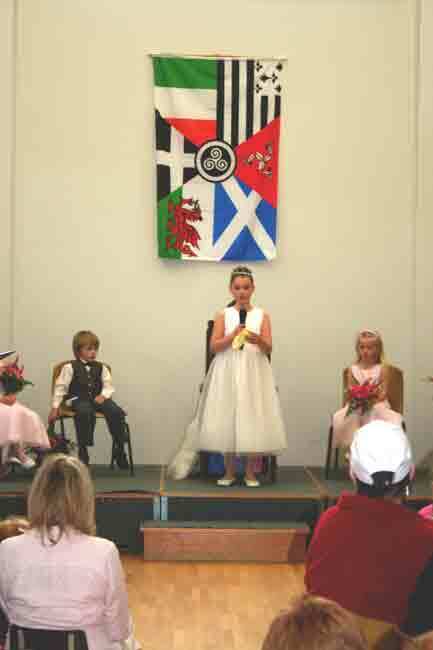 Queen Ffion from Corwen and all the attendants looked lovely in their dresses and outfits. Thank you to everyone who organised the carnival. I had a wonderful day and enjoyed the Hog Roast and the excellent Disco in the evening. It was a very special day for me and I will always remember it. Diolch yn fawr iawn. Queen Chloe delivers her speech in the Village Hall. © Copyright “Y Bont” unless otherwise indicated / Hawlffraint “Y Bont” oni nodir yn wahanol.